Though Eric Rohmer, Jean-Luc Godard, Jacques Rivette, François Truffaut, and Claude Chabrol are all central to the French New Wave and all shared in the critical adventures found in the pages of Cahiers du Cinema, it was Rohmer, who passed away this January at the age of 89, who maintained the steadiest course. Following up on such classic films as MY NIGHT AT MAUD'S (1969), CLAIRE’S KNEE (1970), and CHLOE IN THE AFTERNOON (1972), Rohmer completed a singular body of work touching on the most universal of subjects—matters of the heart. More literary than theatrical in his examinations of the complexities of romance, his characters talk, think, and observe with unique intensity. But what keeps his featherweight dramas and supercilious characters infinitely engaging is how their actions serve to illuminate complex philosophical and ethical dilemmas. In Rohmer’s films, the focal points are never on what the characters say or do, but on the distance between those two, in that netherworld between language and action in which we all try to make sense of the world and ourselves. 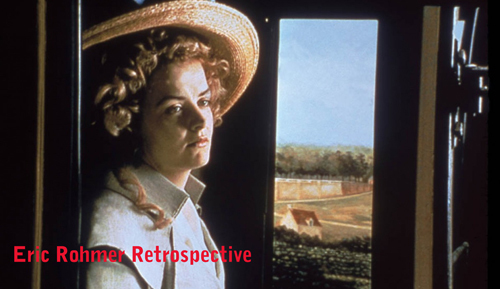 A fuller retrospective is deserving, but for now enjoy these quintessentially French favorites. A wagging tongue bites itself. As close as Rohmer comes to the structure of classic French farce, PAULINE AT THE BEACH sets into motion a roundelay of lovers who spend late summer in a Normandy resort misunderstanding each other’s desires and motives. The Pauline of the title is a pubescent girl who gains a sentimental and sexual education by watching the seductions of the sextet of adults around her, including her glamorous cousin who wants to “burn of love.” The algebraic precision with which Rohmer charts their flirtations, betrayals, and disputes is offset by the film’s eroticism and its halcyon summer setting. “A refreshingly cool entertainment, rigorous, controlled, yet also profoundly passionate.”—Andrew Sarris, The Village Voice. Sponsored by the Alliance Française de Portland. “A TALE OF SPRINGTIME follows Natacha, an 18-year-old pianist who has talent for music but not for life. She decides that her father, on whom she dotes, should drop his current mistress for another woman, Jeanne, a philosophy teacher whom Natacha adores. The domineering and capricious teenager plots to convince her father that he really belongs with Jeanne, and her stratagems are played out in a series of rendezvous and dinner parties in which philosophical jousting is barely disguised as a form of amorous competition. One of Rohmer’s most refined and delightful films, SPRINGTIME offers a panoply of pleasures: music by Beethoven and Schumann, deluxe Paris apartments and French country houses, engrossing chat about Kant and Aristotle, lovely ensemble acting, and—as always with late Rohmer—editing and photography of unerring elegance and precision.”—James Quandt, Cinematheque Ontario. 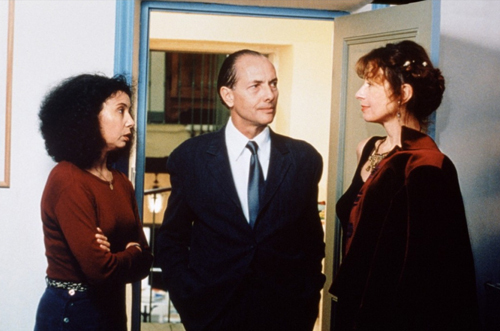 “Rohmer brings his ‘Seasons’ series to a close with a warm, contemplative comedy that looks back at his own career. Two actresses who have grown up in Rohmer’s films—Marie Riviere and Beatrice Romand—are cast as lifelong friends who find themselves slipping into middle age. Romand is a forty-something widow with two grown children who manages her own vineyard in the Rhone Valley. The contentedly married, city-dwelling Riviere decides that her best friend’s life won’t be complete until she finds a man, and sets out to land one for her. A marvelous Rohmer roundelay of mistaken identities and misread motives ensues as Riviere finds herself falling for the handsome salesman she’s recruited for her friend, and Romand feels drawn to the Don Juanish professor her son’s girlfriend has exhumed for her. As always, the pleasure of Rohmer’s filmmaking lies in the contrast between the geometrical certainties of his plotting and the unpredictable emotions of his characters. The autumnal atmosphere culminates in an outdoor wedding, a swirling celebration that seems to promise ultimate happiness for all Rohmer’s characters, past and future.”—Dave Kehr. Unhappy with both historical novels about the French Revolution and the films made from those novels, Rohmer decided to employ two distinct strategies: he used a first-hand account of events, which in his mind was far more “truthful” than any historian’s; and, more audaciously, he avoided shooting in external settings, employing digital imaging throughout the film to recreate the city and period in exactitude. As he explained, “The face of Paris has changed so drastically that there is not one line of sight left from revolutionary times.” Grace Elliott was a young Scottish aristocrat who found herself stuck in Paris during the Revolution. The film depicts the subtle relationship between Grace and Philippe “Egalite,” Duke of Orleans and cousin of Louis XVI, King of France. Once lovers, the two of them still share a complex and ambiguous friendship which is rendered all the more difficult by the stress of the events that begin to swirl around them. As in all his work, loaded conversation (and what it reveals and disguises about the characters) takes the central position in the film. Rohmer effortlessly engages us in the nuances of Grace and the duke’s conversation, while leading us towards the different fates that await those caught in the historic swirl.